Heavy clashes have broken out along the border between Eritrea and Ethiopia. Although there have been occasional exchanges of gunfire ever since a two-year border war ended with a peace deal in 2000, these are the first involved heavy artillery and masses of troops. Eritrea's ministry of information blamed Ethiopia, saying on Sunday, "Ethiopia unleashed an attack against Eritrea on the Tsorona Central Front." Ethiopia blamed Eritrea, saying, "Eritrean forces started shelling our positions, including civilian ambulances, and we responded." It's not known what triggered the new violence. Eritrea is currently celebrating 25 years since it achieved independence from Ethiopia in 1991, and perhaps those celebrations triggered the violence. 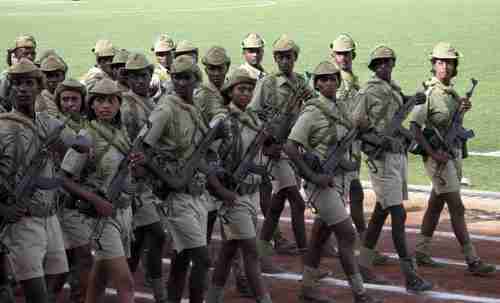 Eritreans continue to be subjected to indefinite military/national service. The Government has recently confirmed that there are no plans to limit its duration to the statutory 18 months. Conscripts are drafted for an indefinite duration of service in often abusive conditions, and used as forced labor." These two countries have been linked since at least the second century AD. Ethiopia adopted Christianity in the 4th century, and was a tribal society ruled by emperors until the 1800s. However, a split between Ethiopia and Eritrea occurred in the 700s with the rise of Islam and the Arab trade along the Red Sea, and what is now Eritrea became part of the Islamic Empire, and later the Ottoman Empire. Italy colonized the region in the 1860s, in the so-called Scramble for Africa, so named because after it was discovered in the 1850s that malaria could be controlled with quinine, England, Belgium, France, Portugal, Italy, Spain and Germany all competed with each other to colonize different parts of Africa. In 1869, the Suez Canal opened, connecting the Red Sea with the Mediterranean Sea, and Italian shipping firms became active. Large stretches of Eritrea's coastline were acquired from the local sultans and transferred to Italian control. By the mid-1880s, the Italian army moved into Eritrea, displacing the Ottomans, and challenging the Ethiopian empire. In 1889, Menelik II rose to the position of Emperor of Ethiopia. The "Italian-Ethiopian War" (1889-1896) was a generational crisis war for Ethiopia. Menelik inflicted on Italy the most humiliating and bloody defeat ever experienced by a colonial power in Africa. In the outcome, Italy retained Eritrea as a Red Sea colony, populating it with thousands of Italian settlers, developing road and rail transport, but doing little to improve the lives of Eritreans. Ethiopia gained independence, and by 1914 and the beginning of WW I, all of black Africa except Ethiopia and Liberia were European colonies. By 1935, Eritrea was a colony of Italy, and Ethiopia had a new emperor, one who had taken the title Haile Selassie, meaning "Might of the Trinity," emphasizing the fact that Ethiopia was a largely Christian country. In October 1935, Italian dictator Benito Mussolini ordered an invasion of Ethiopia, partly in revenge for Italy's humiliating defeat in 1896. Mussolini announced the establishment of a new Italian empire, including Ethiopia, Eritrea and Somalia, under the name Italian East Africa. Haile Selassie fled the country. When Mussolini brought Italy into World War II on Hitler's side, in June 1940, Haile Selassie won the cooperation of Britain in launching a counterattack against the Italian forces in Italian East Africa. By 1941, Haile Selassie was once again emperor of Ethiopia. After the war, the United Nations made Eritrea a part of Ethiopia, an autonomous federal province with its own constitution and elected government, something that the Muslims in Eritrea strongly opposed. From the above description, one can see that although World War II was a generational crisis war for Italy and Britain, with part of the war fought on Ethiopian soil, it was not a crisis war for Ethiopia itself. In fact, with the previous crisis war having climaxed in 1896, this was a generational Unraveling era for Ethiopia. In such an era (like America in the 1990s), there is little appetite for war among the general population, except perhaps for quick police actions. Although Ethiopia and Eritrea changed hands several times during the WW II time period, the fighting was mostly between foreign armies, and did not heavily involve the local population. In the mid-1950s, the region entered a generational Crisis era, and the fault line between Muslims and Christians began to inflame. In 1958, Eritrea's Muslim leaders formed the Eritrean Liberation Front (ELF), consisting mainly of students, intellectuals, and urban wage laborers. Low-level warfare continued throughout the 1960s. In the 1970s, the Eritrean independence movement took another turn with the formation of a powerful Marxist offshoot of the ELF, the Eritrean People's Liberation Front (EPLF). Haile Selassie was toppled in 1974, after which factional warfare began to increase. The guerrilla war fought by Marxist rebels against the well-armed Ethiopian government climaxed in May 1991 with the collapse of Ethiopia's government, coincident with the collapse of the USSR. Eritrea finally declared independence. By that time, there were 500,000 refugees that had fled to refugee camps in Sudan, and they had to be resettled in Ethiopia and Eritrea. In 1998, a new border war broke out between Eritrea and Ethiopia. This was a non-crisis war, with a quality very similar to World War I, where trenches were dug, mines were laid, and bodies of dead soldiers were strewn about. Of the 400,000 men who fought on both sides, 50,000 soldiers died. A peace deal in 2000 ended the two-year border war, but it was never fully implemented, and is still in dispute. There have been occasional border incidents ever since then.